IX.12.6 Pompeii. 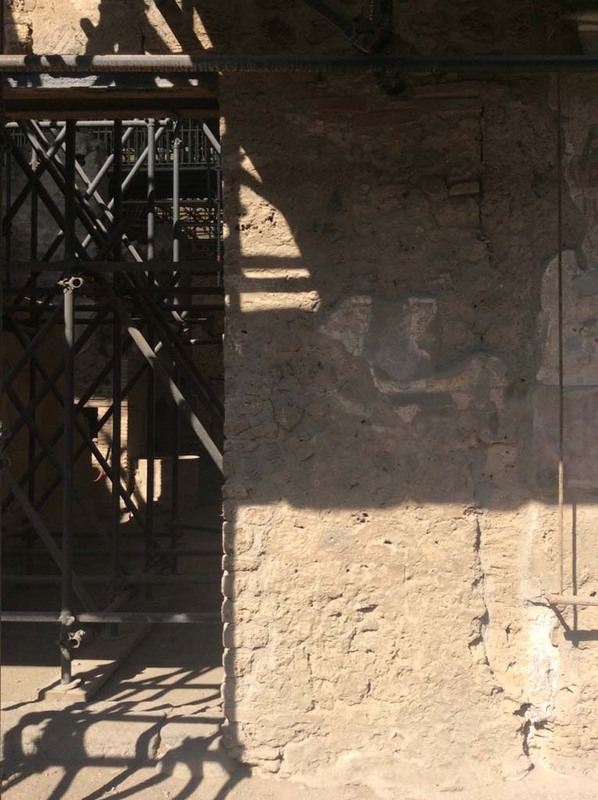 House of the Chaste Lovers or Casa dei Casti Amanti or Officina of Crescens. 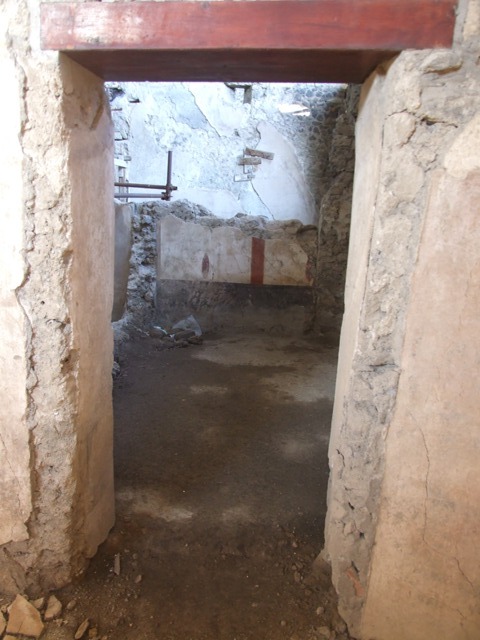 “To celebrate the Feast of St. Valentine, the Superintendency of Pompeii is re-opening the doors to the House of the Chaste Lovers, after a long period of closure, before the onset of major works which will allow a total restoration and development, as well as a reconfiguration of the escarpments of the area. 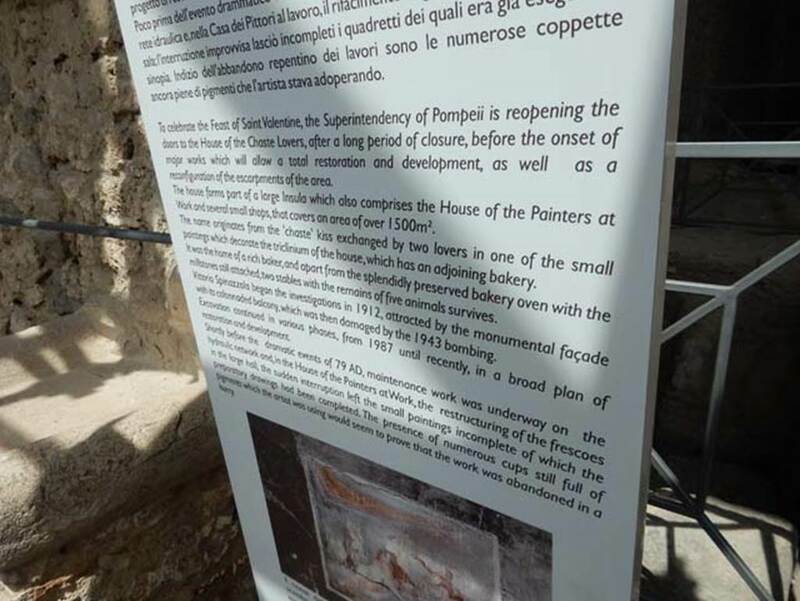 The house forms part of a large insula which also comprises the House of the Painters at Work and several small shops, that covers an area of over 1500 sq. metres. 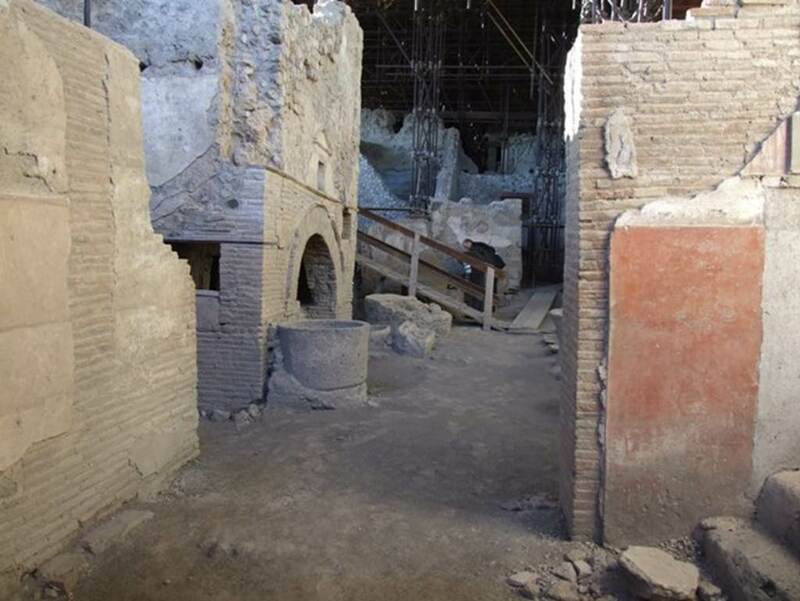 The name originates from the “chaste” kiss exchanged by two lovers in one of the small paintings which decorate the triclinium of the house, which has an adjoining bakery. It was the home of a rich baker, and apart from the splendidly preserved bakery oven with the millstones still attached, two stables with the remains of five animals survives. 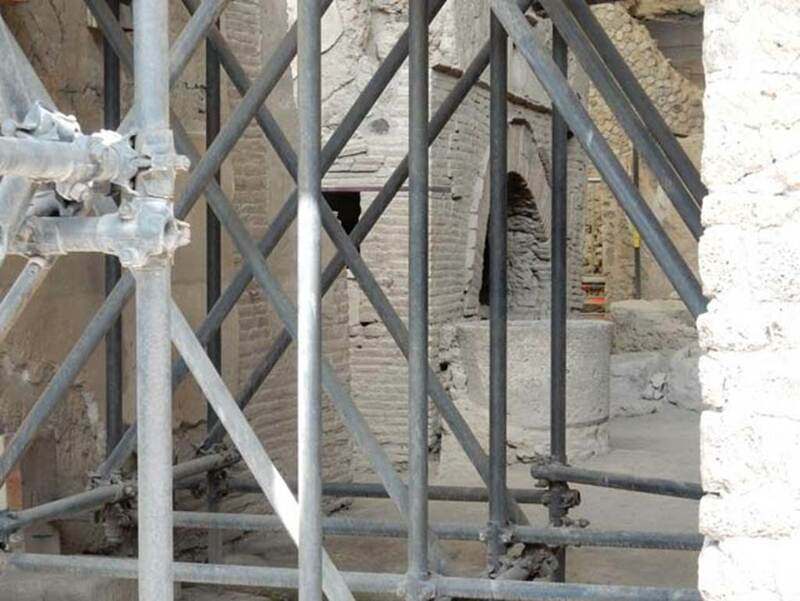 Vittorio Spinazzola began the investigations in 1912, attracted by the monumental façade with its colonnaded balcony, which was then damaged by the 1943 bombings. 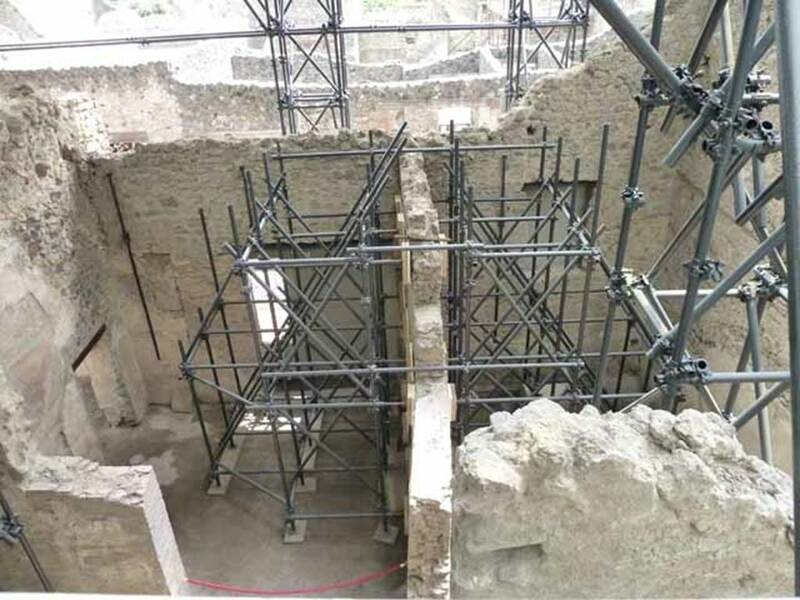 Excavation continued in various phases, from 1987 until recently, in a broad plan of restoration and development. 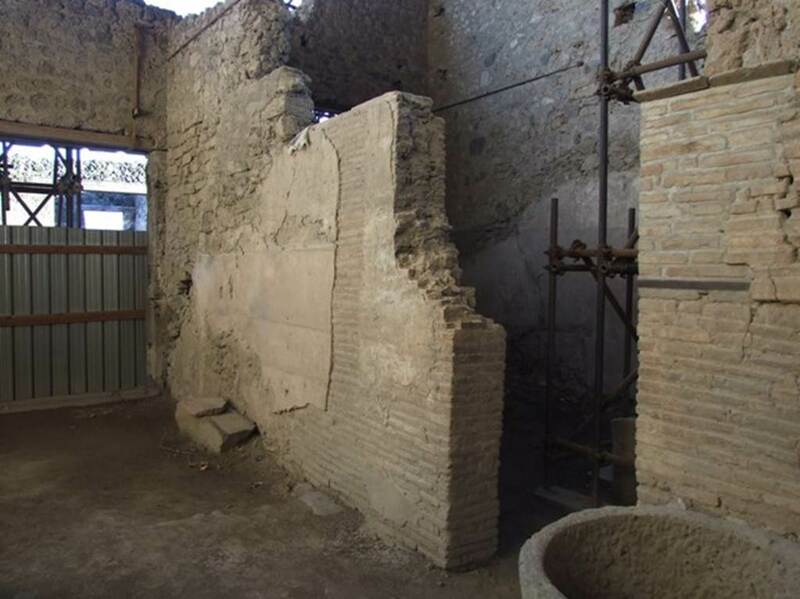 IX.12.6 Pompeii. December 2005. Entrance. IX.12.6 Pompeii. Shop sign from right side of front façade. 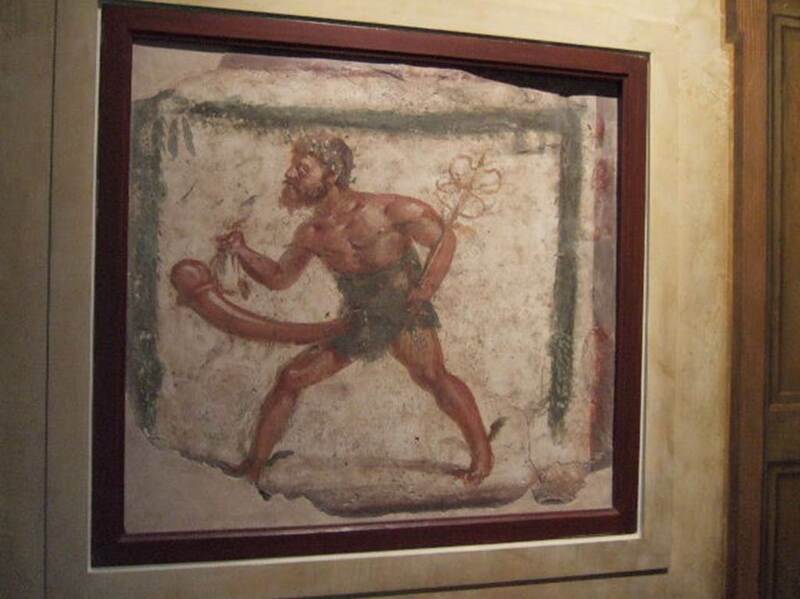 Painting of crowned and bearded ithyphallic Mercury with caduceus and purse. See Fröhlich, T., 1991. Lararien und Fassadenbilder in den Vesuvstädten. Mainz: von Zabern, F70, p. 338, tav. 16,2. 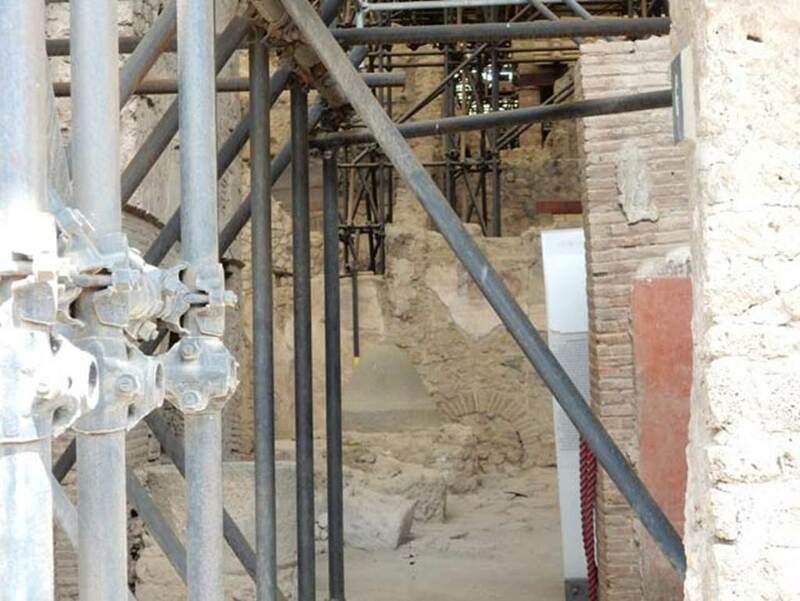 …A giustificare ciascun segmento di tettoia, che vedesi chiaramente confermato dai fori dei travicelli scoperti nella muratura, dobbiamo pensare ad altrettanti affreschi che dovettero abbellire la facciata di quest'edificio: uno solo ne abbiamo oggi, all'angolo fra lo stipite destro e l'altezza dell'architrave del vano n. 6; ma, molto probabilmente, due altri ve ne furono nell'antichità, l'uno sullo stipite opposto del vano e l'altro all'estremità occidentale della facciata: però nulla ne avanza oggi, in seguito alla totale caduta degli intonachi. Mercurio barbato, adulto, smisuratamente itifallico, il capo coronato di foglie verdi, i fianchi cinti di una breve fascia verde, tutto nudo nel resto, vedesi accorrere verso sinistra, cioè verso il vano n. 6, le ali ai piedi, il caduceo nella sinistra accostata al petto, il marsupium nella destra protesa; stato di conservazione perfetto; esecuzione non priva di energia espressiva. Vedi Notizie degli Scavi di Antichità, 1912, pp. 258-9. [According to Della Corte in NdS 1912, (29 July). Reg. IX, ins. XII. 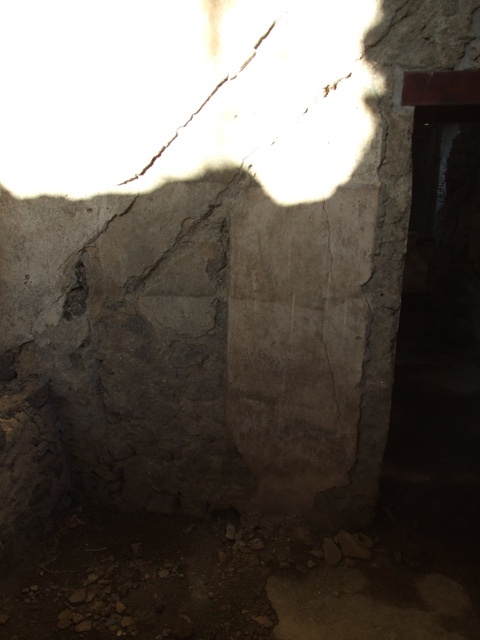 The excavation on the front of this insula……..
…To justify each segment of roofing, which is seen clearly confirmed by the rafter holes discovered in the wall, we must think that many frescoes adorned the facade of this building: only one of which we have today, on the corner between the right jamb and at the lintel height of entrance no. 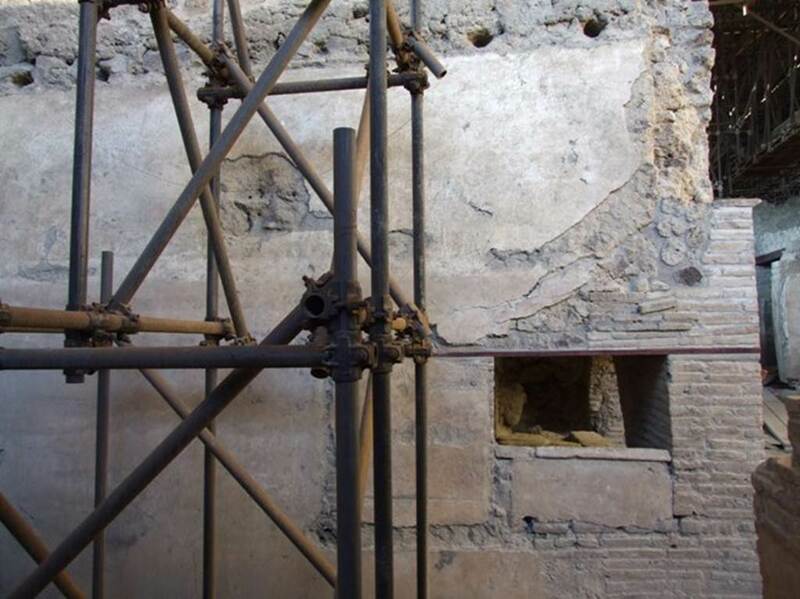 6; but, very probably, there were two others in antiquity, the one on the door frame opposite and the other at the western end of the facade: although nothing remains today, following the total fall of the plaster. Mercury bearded, adult, hugely ithyphallic, his head crowned with green leaves, the hips girded by a short green band, the rest all naked , is seen rushing to the left, that is towards the entrance no. 6, the wings on his feet, the caduceus in his left hand against his chest, his purse in his right outstretched hand; in a perfect state of preservation; the execution is not without expressive energy. 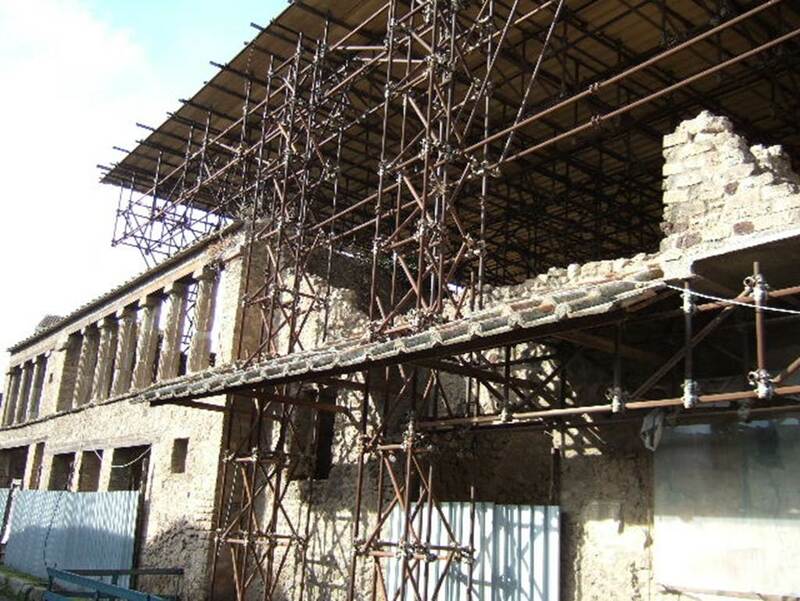 IX.12.6 Pompeii. December 2005. Graffiti beside door, between IX.12.6 and IX.12.7. IX.12.6 Pompeii. December 2005. Façade. IX.12.6 Pompeii. March 2009. Room 10. West wall, with door into room 11, probably used for grinding the corn and making the bread. 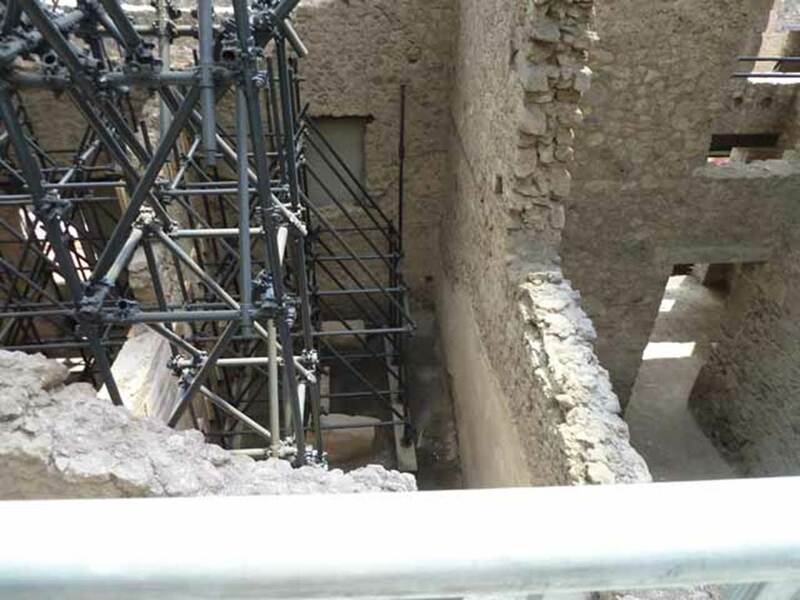 Looking south to room 10 with street entrance at IX.12.6, and room 11 with window, on the right. IX.12.6 Pompeii. May 2010. Room 11 from above, looking south. 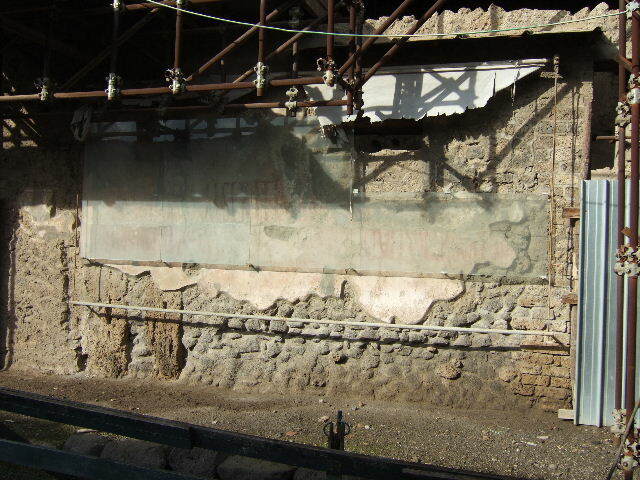 IX.12.6 Pompeii. March 2009. 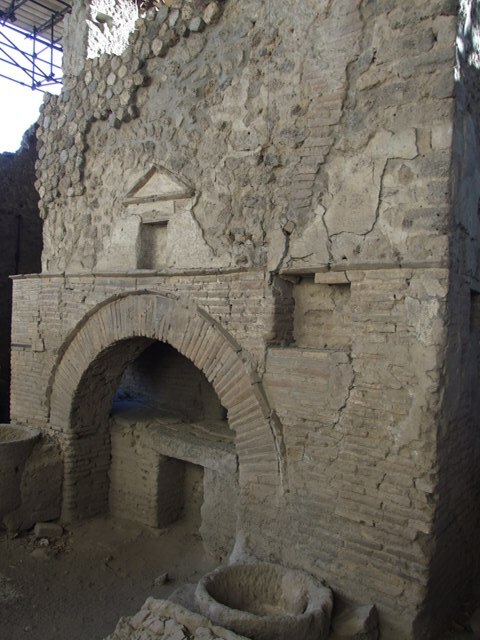 Room 11, north wall, and side of oven. 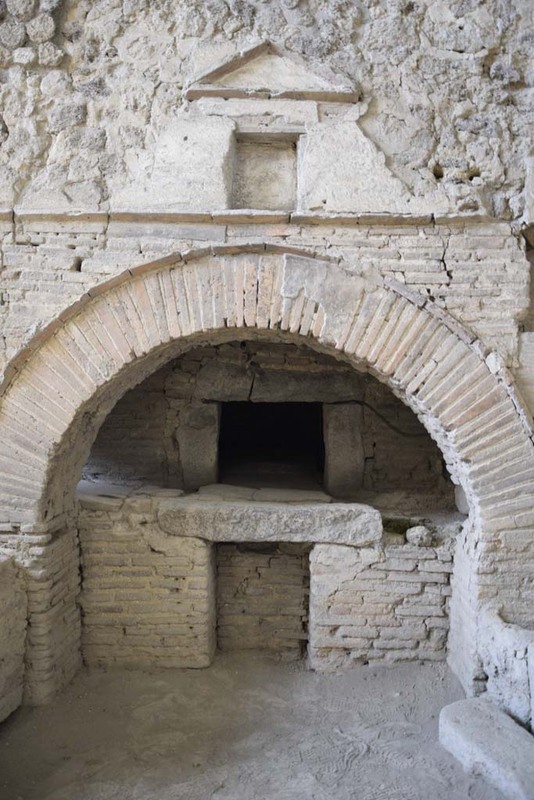 The bread would have been put into the oven through the square opening. IX.12.6 Pompeii. March 2009. Room 10, looking north to bakery, room 5. 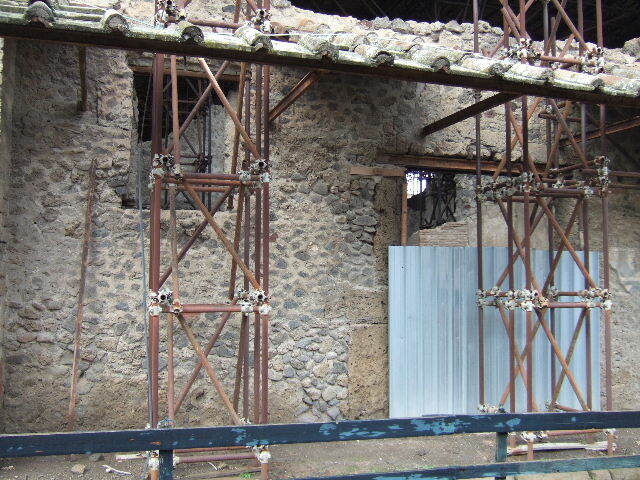 IX.12.7 Pompeii, May 2018. Room 10, looking north from entrance doorway towards oven in room 5. 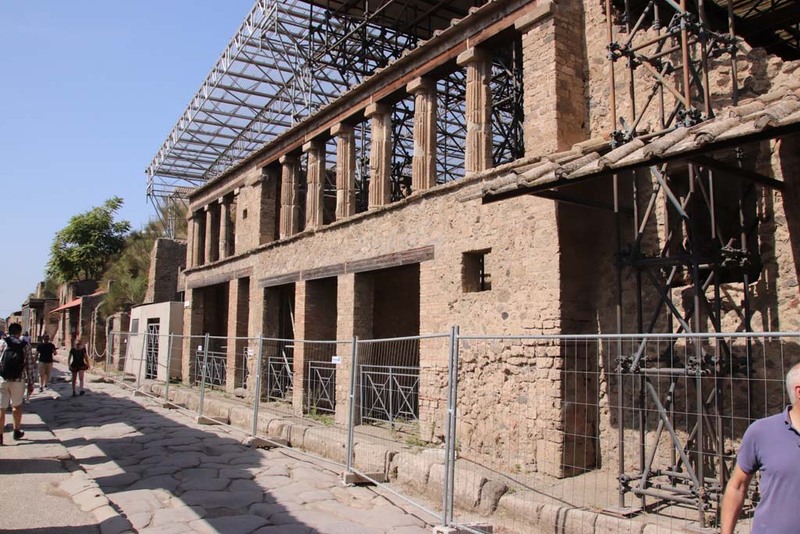 IX.12.6 Pompeii, May 2018. Room 5, bakery, looking north from entrance doorway. Photo courtesy of Buzz Ferebee. IX.12.6 Pompeii. March 2009. Room 5, oven in bakery. IX.12.6 Pompeii. March 2009. Room 10, stairs in north east corner. IX.12.6 Pompeii. March 2009. 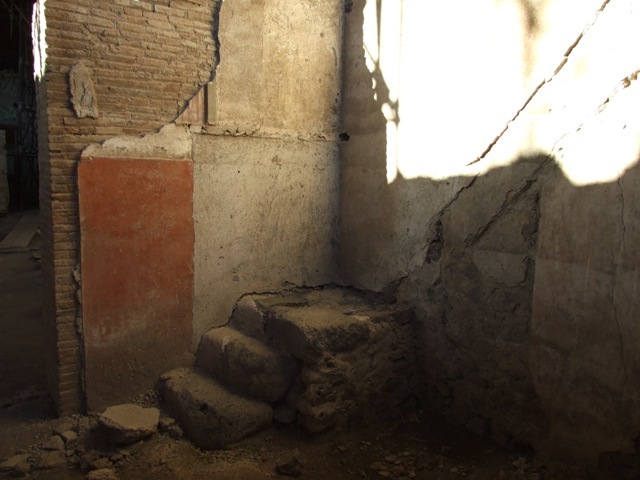 Room 10, east wall, with site of staircase. IX.12.6 Pompeii. March 2009. Room 10, doorway in east wall leading to room 9. IX.12.6 Pompeii. March 2009. Room 9, south-east corner. IX.12.6 Pompeii. March 2009. Room 9, west wall with doorway to room 10. IX.12.6 Pompeii. March 2009. Room 9, south wall.